In this course a learning pathway refers to a sequence of learning resources and activities which are developed to guide and support learners through their journey in achieving the learning outcomes. Learning pathways are the building blocks for full courses and when grouped together cover broad themes within a course. One learning pathway usually constitutes a coherent concept which can stand on its own as a learning sequence, and typically requires 1 – 4 hours of learning effort. 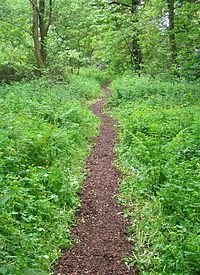 The metaphor of a pathway is used to suggest flexibility for learners to choose how they complete their learning journey. In the OERu context the concept of a “learning pathway” was chosen to avoid confusion with the use of terms like units, sections or modules, which have different meanings in the typology of course structures within the wide range of institutions and countries participating in the OERu network. So for example: A “Module” at University of South Wales is the equivalent of what Otago Polytechnic would call a “Course” within a degree programme. A “Unit” at University of Southern Queensland is a full course, whereas a “Unit” at Athabasca University is a subsection within a course. When developing materials at the OERu, we intentionally avoid using concepts in text which could result in confusion and additional work when reusing materials in different contexts.